George Bell, Jr. was born on 22 January 1859 at Ft. McHenry in Baltimore, MD, the son of Brigadier General George Bell, U.S. Army. 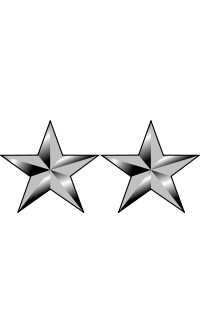 He attended the U.S. Military Academy, graduated with the Class of 1880, and was commissioned as a Second Lieutenant. After graduation, he was posted to assignments throughout the country, including serving as Professor of Military Science at Cornell University. In 1894 he received a law degree from Cornell and passed the New York bar exam. He served in the Spanish-American War's Santiago Campaign and the Samar Campaign of the Philippine Insurrection. In 1907 Bell was appointed to the Infantry Equipment Board, taking part in the design of many items that were later used in World War I. 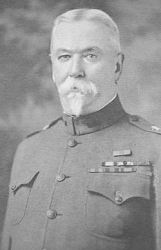 At the start of World War I, Bell was promoted to Major General and assigned to command the Illinois National Guard's 33rd Division. He commanded throughout the war, with the 33rd attaining distinction as the only American Division to fight while organized with both French and British forces, as well as fighting under its own flag. After the war, he commanded Sixth Corps with headquarters in Chicago until reaching the mandatory retirement age of 64. Bell Bowl Prairie, Chicago's Bell Park, and George Bell American Legion Post were named for him in Illinois. Major General George Bell, Jr. died on 29 October 1926 in Chicago, IL. He is buried at Rosehill Cemetery and Mausoleum in Chicago, IL.